That’s odd, I thought I recognized this address. It’s the location of the Rocky Bottom Prop Shop. 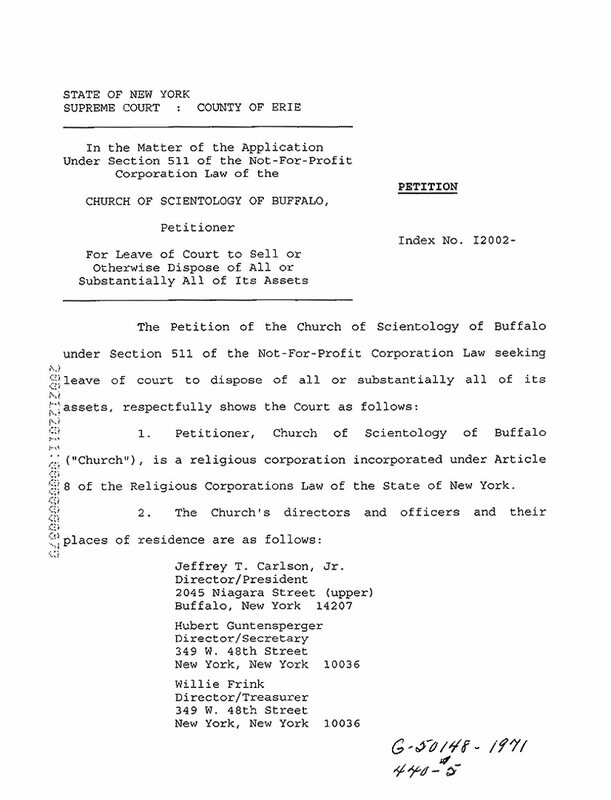 This address is the same as the one listed for the Buffalo Scientology Director, Jeff T. Carlson. Why would a director for Scientology have the same address as the Buffalo Criminon Office? The Hubbard-based program – which can cost thousands of dollars – is considered a religious rite. But a form of it is made available – for “secular purposes,” the church maintains – and licensed under the names Narconon and Crimonon, the latter for use in prisons. It is the Second Chance Program, which is licensed by Crimonon, that Scientologists and prison officials have joined forces to bring to the Erie County Holding Center. Hubbard’s scientific theories and methodologies have drawn criticism from addiction specialists. Former Surgeon General C. Everett Koop criticized Hubbard’s drug-treatment theories following the publication of a book touting them. “Reg” is Scientology jargon meaning, “to put the squeeze on”. It derives from “registrar”, the church post concerned with signing up members to join the Sea Org, staff or pay for additional high-priced courses, books and tapes. Below are excerpts from a 2004 application for a grant submitted to the Community Foundation for Greater Buffalo, http://www.cfgb.org/. My comments follow. Teresa Reile Reger is the President of the Church of Scientology Buffalo. She also holds the “hat” (Scientology jargon for post) of Director of Special Affairs (DSA) Buffalo. CFGB’s records show that Reger’s grant application was not funded. It did not even make the list of five finalists. Teresa did request the funds by December 1, 2003, three months earlier than the grant was awarded. According to Scientology’s Buffalo Org website, they deliver these detoxification regimens, also. “Facilities include a public lounge and even a 24-person sauna (for delivery of the Hubbard program called the ‘Purification Rundown® procedure’).” Narconon’s detoxification therapy uses vitamin and mineral doses far above the safe limits. So what does the financial flow chart of these Scientology related organizations look like? Those were some of the responses, when Erie County Officials were questioned about the Second Chance Program by the Buffalo News on April 6, 2003. Is Gallivan referring to West Seneca insurance agent, Scientologist and WISE affiliate, Joseph Sgroi? $500,000 allocated by Erie County, $200,000 pending.